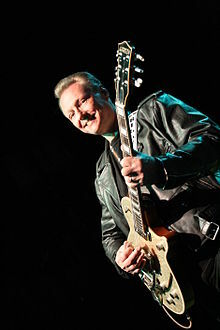 Billy Zoom (born Tyson Kindell on February 20, 1948, in Savanna, Illinois) is an American guitarist, best known as one of the founders of the punk rock band X. He is an Orange, CA, resident and owns the Billy Zoom Custom Shop near Old Towne Orange. At 68 years old, Zoom was diagnosed in 2015 with an aggressive form of bladder cancer and began immediate treatment. He has since stated that he is "cancer-free" but will continue receiving chemotherapy treatments. The son of a big band woodwinds player, Kindell began playing a variety of instruments, including violin, accordion, piano, clarinet, tenor, alto, and baritone saxophones, flute, banjo, and guitar. Upon moving to Los Angeles in the 1960s, he worked as a session guitarist while attending technical school for training in electronics repair. He has an insider's reputation as an expert in the maintenance, restoration, and modification of vintage tube amplifiers and combo organs. He has performed custom technical work on the amps for a host of electric guitarists and bassists. Although best known as guitarist and founding member of punk rock band X, Zoom has also worked with rockabilly legend Gene Vincent, The Blasters, Etta James, Big Joe Turner, Mike Ness, and dozens of other major recording artists. On stage, he is known for his wide-legged stance, big grin and tendency to make eye contact with audience members. He adopted this presence in reaction to many guitarists whose body histrionics and facial expressions gave the impression that they were playing very difficult parts on their instruments. Zoom wanted to make everything look easy. In June 2008, in honor of his contributions to both the world music community and the legacy of Gretsch guitars, Gretsch unveiled the G6129BZ Billy Zoom Custom Shop Tribute Silver Jet. ^ "X guitarist Billy Zoom diagnosed with bladder cancer". Ocregister.com. 9 July 2015. Retrieved 17 January 2019. ^ Childers, Chad. 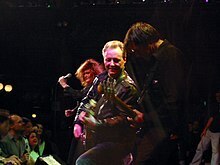 "X's Billy Zoom Cancer Free, Hopes to Return for Shows". Loudwire.com. Retrieved 17 January 2019. This article on a United States rock guitarist is a stub. You can help Wikipedia by expanding it. This page was last edited on 14 March 2019, at 16:27 (UTC).